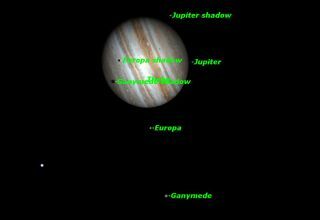 The shadows of Ganymede and Europa will follow each other across the face of Jupiter. The best views will be in western North America. The First Quarter Moon rises around noon, and sets around midnight. The Full Moon of January is usually called the Old Moon. In Algonquian it is called Wolf Moon. Other names are Moon After Yule and Ice Moon. In Hindi it is known as Paush Poornima. Its Sinhala (Buddhist) name is Duruthu Poya. The Full Moon rises around sunset and sets around sunrise, the only night in the month when the Moon is in the sky all night long. The rest of the month, the Moon spends at least some time in the daytime sky. The Last or Third Quarter Moon rises around 1 a.m. and sets around 11 a.m. It is most easily seen just after sunrise in the southern sky. The First Quarter Moon rises around 11 a.m., and sets around 1 a.m. The Quadrantids, one of the three best meteor showers of the year, reach their peak with an zenithal hourly rate of 120 meteors per hour. Two of Jupiter’s moons, Ganymede and Europa, will pass in front of Jupiter. Europa’s icy surface reflects much more light than Ganymede, so appears as a white spot against Jupiter’s clouds while Ganymede appears as a dark gray spot. Again, the best views will be in western North America. The brightest and the faintest of the planets are in conjunction tonight. Neptune, at magnitude 8.0, will be just above Venus, at magnitude –3.9, a difference in brightness of 11.9 magnitudes. Venus will be easy to spot with the naked eye, but Neptune will require binoculars or a small telescope. Mercury may be glimpsed in the southeast just before sunrise at the beginning of the month, but is too close to the Sun the rest of the month. Venus is a brilliant object in the evening sky after sunset all month. The waxing crescent Moon will pass close to Venus on Wed. Jan. 25 and Thu. Jan. 26. Mars spends all of January on the border between Leo and Virgo. It grows in size from 9 arc seconds to 12 arc seconds during the month, large enough to reveal its polar cap and dark surface markings in a 5-inch (125-mm) telescope. By the end of the month it reaches magnitude –0.5, making it the brightest object in the morning sky except for Sirius and the Moon. Jupiter continues to be well placed in the evening sky all month on the border between Aries and Pisces. Jupiter and Venus are the brightest objects in the evening sky other than the Sirius and the Moon. Saturn is high in the eastern sky before dawn. It now shines brighter than nearby Spica. Uranus is well placed in the early evening in Pisces all month. Neptune is low in the west at sunset in Aquarius. It passes just north of Venus on January 12.